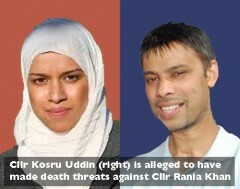 A Labour councillor in Tower Hamlets, Kosru Uddin, 45, has been arrested following allegations that he made a death threat to female fellow councillor, Rania Khan, who is a supporter of independent Mayor Lutfur Rahman. Cllr Uddin was held in custody overnight for questioning today and has now been released on bail. Sources report that abuse, violence and intimidation took place in the council chamber after the conclusion of the council meeting involving Cllr Uddin, Cllr Khan, her mother, Lutfa Begum, and even female Labour councillor, Shiria Khatun, in the act of trying to restrain Cllr Uddin who is, ironically, the Labour spokesperson on Police and Community Safety. One unexplained aspect of the row about the chief executive appointment concerns Cllr Josh Peck, leader of the Labour group. He absented himself both from the appointment panel of which he was supposed to be a member and the council chamber when the full council considered it in a session closed to the public. We understand this was because he had been advised that he had a prejudicial interest in the matter, having previously made it clear to the Acting Chief Executive that he was opposed to his appointment. However, we understand that this did not stop him leading the debate at the Labour group meeting and persuading them to agree a procedural basis for rejecting the panel’s majority view. All Labour councillors were then instructed to vote for that motion. Normally, decisions on appointments are not subject to the whip since individual councillors are supposed to use their personal judgement. Cllr Peck’s procedural motion appears to have been a device to attempt to force Labour councillors to act in accordance with Cllr Peck’s wishes. Whilst a number of Labour councillors reluctantly voted in accordance with these wishes, three councillors nevertheless did break the whip. Posted in: Labour, Local Government, Politics. Can’t we leave it to Gilligan and the rest of the rightwing press to attack the party? You’re obviously revelling in this, which is a shame I think. Sometimes branches of a family tree need to be chopped off. I like Rania though – probably the only one of the independents i’ve any time for. A shame she defected we need more decent female Cllrs. We just seem to lurch from one disaster to the next in THLP – really difficult to get new members involved when stuff like this keeps happening meh. Robbie, I thought that Labour in Tower Hamlets was following the agenda set by Gilligan. He was the one spreading alarmist (and unsubstantiated) stories about an Islamic Republic under Luftur. He should never have been barred from being Labour’s candidate. Racists need not bother placing their comments here. They will simply not be published.